Yellow-headed Amazons (Amazona oratrix) are Endangered due to heavy trapping for the wild bird trade, hunting and persecution, and extensive habitat loss. Project and progress: In 1999 WPT and American Bird Conservancy (ABC) aided the Belize Zoo in its educational programme to build awareness for and monitor breeding of the Yellow-headed Amazon. Outcomes: The Belize Bird Rescue is a non-profit volunteer-based center that takes in injured, sick and abused birds and, wherever possible, rehabilitates and releases them back to the wild. The center began rescuing birds in April 2004 with the arrival of two Red-lored Amazon chicks, and as of mid-2011 have cared for 109 birds and made 80+ successful releases, 54 of which have been parrots. 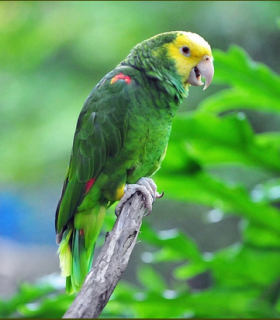 The World Parrot Trust has partnered with the center to aid in the rehabilitation and release of confiscated parrots as well as supporting efforts to protect the Yellow-headed Amazon. Where found: A.o. oratrix: Pacific slope of C Mexico, and Caribbean slope. A.o. tresmariae: Islas Marias, off coast of W Mexico. A.o. belizensis: C Belize and El Peten, N Guatemala; isolated populations NE Guatemala and NW Honduras. A.o. hondurensis: Valle de Sula, NW Honduras. A.o. magna: Tamaulipas, San Luis Potosí, Veracruz, Chiapas, Tabasco and Campeche. History: The Yellow-headed Amazon (Amazona oratrix) has undergone a 90% population decline, since the mid-1970s, to 7,000 birds in 1994. There remains three subpopulations in Mexico: A. o. magna in Tamaulipas, San Luis Potosí, Veracruz, Chiapas, Tabasco and Campeche, A. o. oratrix from Jalisco to Oaxaca (Roberson and Carratello 1997) and A.o. tresmariae on the Islas Marías. Subspecies belizensis is now confined to central and northwest areas in Belize (Clay 1999). Ecology: Yellow-headed Amazons are found in deciduous or evergreen forest, clearings, savanna woodland, Pinus woodlands on ridges, dense gallery woodland; less commonly in dry thorn forest, mangroves or coastal swamp forest and cultivated areas with scattered trees. They are reported to consume buds, new leaves, palm fruits, Acacia seeds, Macuna fruits, figs and some cultivated crops. They are found in pairs or flocks with larger gatherings at communal roosts and feed areas.